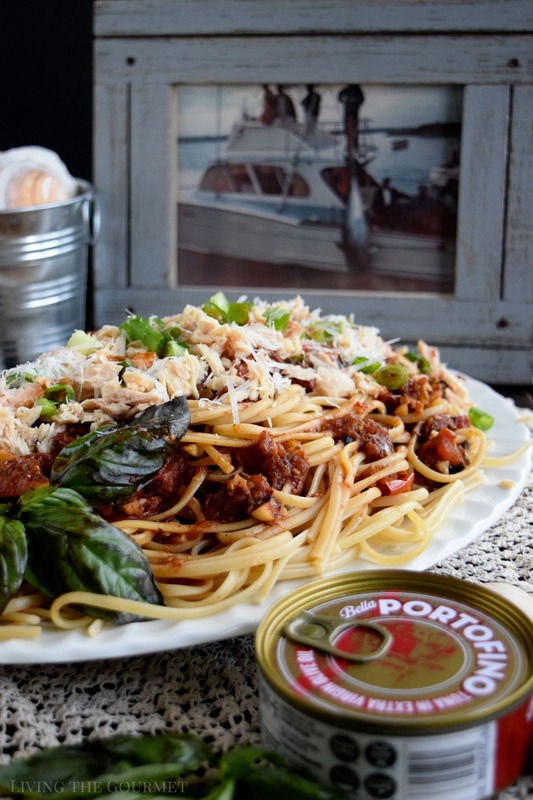 Savor the tastes of a Mediterranean summer with this easy linguine dish served alongside a fresh tomato sauce and Bella Portofino Tuna! 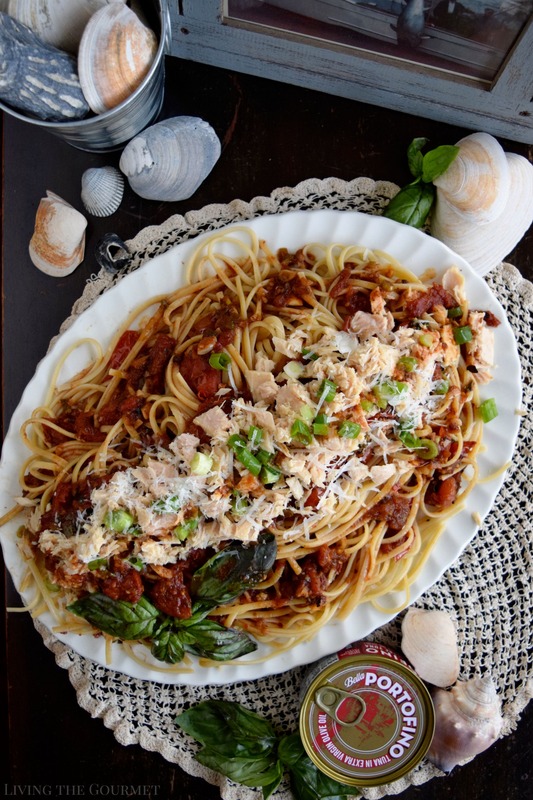 This, naturally, brings us to today’s recipe – Linguine with Fresh Sauce and Portofino Tuna. To start, heat a large cast-iron frying pan, and set the tomatoes in the pan to char – leave the pan and tomatoes dry for this process. Once the tomatoes begin to char, then carefully drizzle some olive over them. 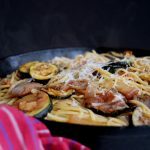 Be careful of the olive oil splattering due to the pan being hot during this process. When the tomatoes have begun to soften, crush them either with a large spoon or a masher. Once that’s done, add in the seasonings listed below along with fresh garlic and chopped scallions, fresh basil, and a splash of wine – reserve a handful of the scallions for use as garnish later. Once that’s done, simmer the sauce over a gentle heat while preparing the linguine. Remember to generously salt the pasta water. While the linguine is cooking, add about six to eight tablespoons of the hot pasta water to the sauce. At this point, you will want to taste the sauce for seasonings and adjust to your preference. After that, lift the pasta onto a serving platter, and then top the pasta with the sauce, then top with the tuna as shown below, the scallions you had set aside for garnish, and top with a dusting of grated cheese. Heat a large cast-iron frying pan and place the tomatoes in the hot pan to slightly char. When the tomatoes begin to char carefully drizzle the olive oil over the tomatoes. The pan is hot so be careful that the oil does not splatter. When the tomatoes or softened gently crush them down with a masher. Add the seasonings, garlic, scallions, chopped fresh basil and wine – reserving a few basil leaves for garnish. Simmer the sauce on a gentle heat while preparing the linguine as directed. Add about three tablespoons of the well-salted pasta water to the sauce. Taste the sauce for seasonings. Drain the pasta and plate. Top with the sauce gently incorporating the sauce into the pasta. Top with the tuna, scallions and grated cheese and serve. And just like that, you’ve got a delicious summer meal. That's a perfect weekday meal! This looks absolutely delicious Catherine, really good! 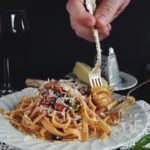 Combining pasta and tuna is such a delicious way to enjoy a wonderful dinner. This is perfect for any night of the week, and even upscale enough to serve to guests too. Pour me a glass of wine and sit back and enjoy!! For me, there's truly nothing quite like a summer afternoon... And a plate full of pasta! Especially when that pasta doesn't require a ton of work (more time to lounge in the sun... and sip wine!) and involves delicious tuna. I'm all about this! I love lazy summer days! This pasta will be perfect for the next time it gets blazing here! My mom made something similiar and I loved it. What perfect timing to try tonight its! Friday! 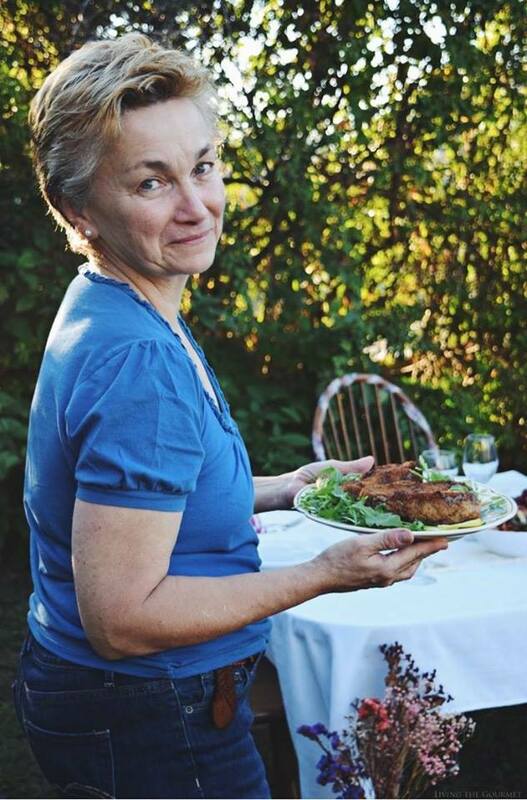 Looks so delicious Catherine! I am going to make it soon! We make a similar dish quite often. This looks so good, I will definitely try this (love the addition of red wine :)). A lovely meal for one of those perfect summer afternoons. A delight. Oh wow! 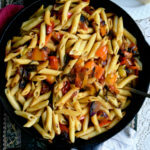 What a hearty and delicious pasta! Yes to all of this! It looks so tasty and flavorful! I will have to try it! I love fresh tomato sauce, just the pasta and that would make me happy. The tuna would make hubby happy. We love the sea. That's why Hubby and I always vacation there. Something just calls to us and as you feel the warm sun and salty breeze all troubles disappear. Now we are big into tuna!! I really think it's move versatile than just a tuna salad. I haven't tried the portofino brand but will keep my eye out for it. 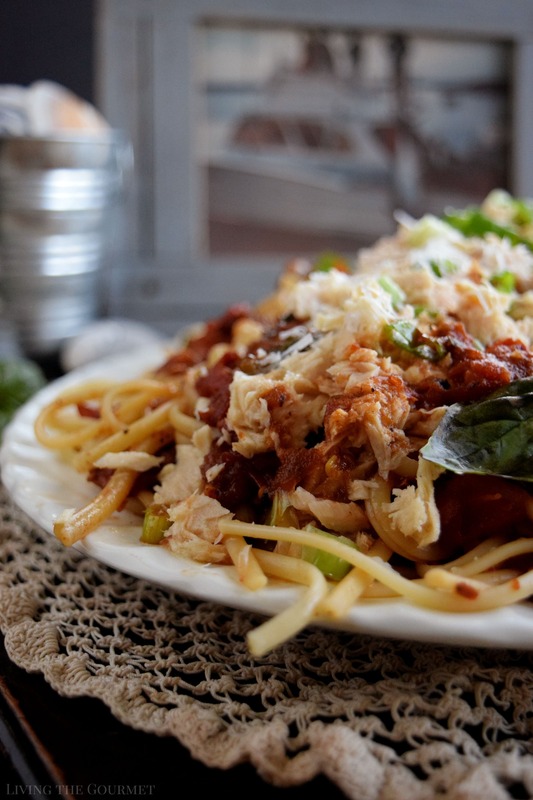 Your linguine with fresh sauce looks delicious. What an elegant looking meal! This would definitely be perfect for the summer, when the last thing you want to do is turn on the oven. Oh heavens.. This looks amazing - so healthy , tasty. I love tuna in Pasta. 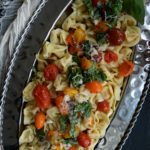 This is a gorgeous summer dish. 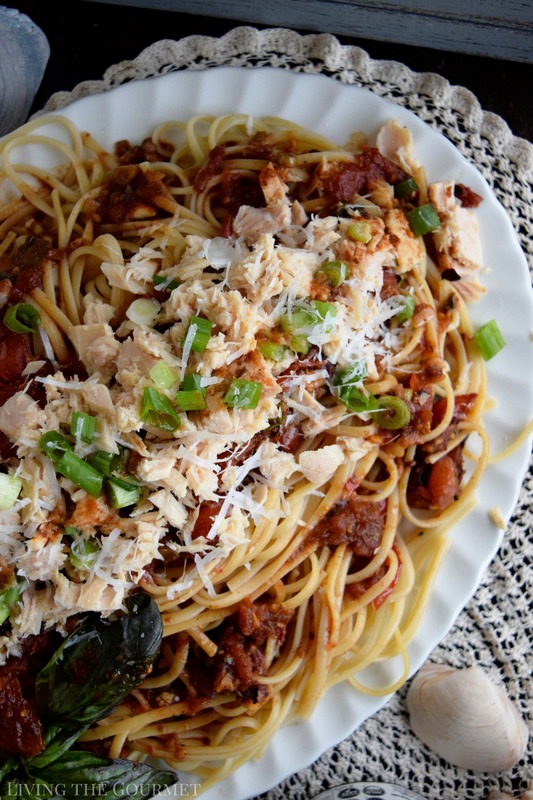 We often eat pasta and we love tuna for dinner but not sure why I have never combined the two. I must try this one soon. Sounds so incredibly delicious. Saving for later. 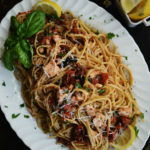 You upgraded the tuna into exotic linguine and tuna.Love the addition of fresh sauce that always make it perfect and more flavorful than the store bought sauces. I always though tuna in salad but you changed my mind.